As we all know, advertising folk like to get creative when they are trying to sell us things, not least linguistically. As a result, one of the joys of sitting on the London Underground is, for me at least, the advertising. One of the most striking campaigns I’ve seen recently is one for a new music app, called Bloom.fm. 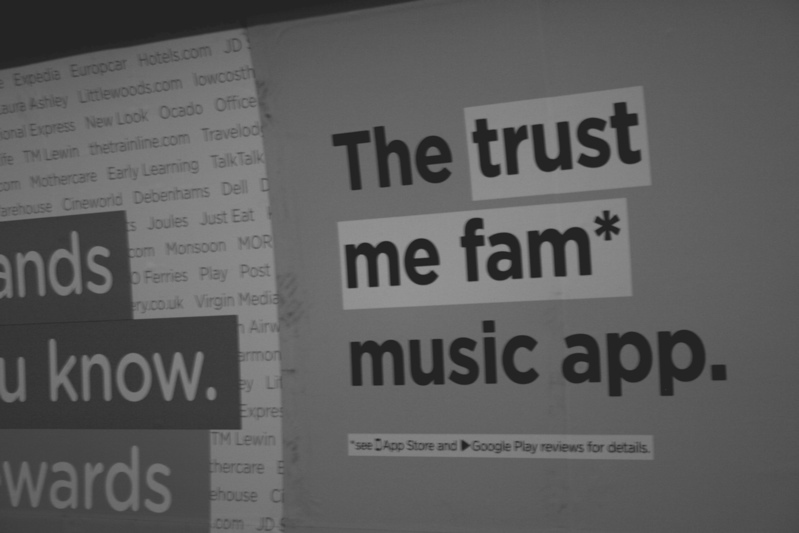 Like the ‘Keep Calm and Carry On’ phenomenon in the UK, it hinges on creative linguistic variation around one very simple grammatical structure: what you might call – for want of a better term – the ‘I want to sell you a music app’ construction. The ad campaign is interesting linguistically because it shows – in English at least – just how many things you can shove into that slot between the determiner (like ‘a’ or ‘the’) and the noun (‘music app’) within a noun phrase (like ‘the music app’). ‘Absolute steal at £1m’ is an adjective phrase, for example; ‘best thing since sliced bread’ and ‘absolute steal at £1‘ are noun phrases; ‘I may even subscribe’ is a clause or a sentence. Otherwise, the compact conversation ‘(are you) borrowing music?? (that’s a) brilliant idea’ is effectively two sentences back-to-back, each with bits implied but stripped away. And, finally, ‘I recommend this app for music awesome save money 5 star quality like it very much thanks for the app’ is a sentence, then an adjective, then a sentence, then a noun phrase, then two more short sentences: it might be ungrammatical nonsense but, in the context of the ad, it’s carefully constructed nonsense. The point is, of course, that the possibilities with this slogan are quite literally infinite. In other words, the construction is a goldmine for linguistic creativity – which is why it’s such a clever advertising campaign. What was that ‘wake me up before you go-go’ song? I hate all that ‘I love you’ stuff! Do you remember the ‘I Can’t Believe It’s Not Butter’ controversy? Because of subtleties like this, a full discussion of this type of construction would probably take up quite a few pages (and get linguists like me really excited). However, I’m just going to cover one other feature of this type of construction – something that lends itself to even more creative possibilities. Admittedly, it’s a little far fetched (and a little awkward to render in written English given the limitations in punctuation), but it’s a linguistic possibility. Not only can you add almost any sentence between a determiner (like ‘the’) and a noun (such as ‘music app’) to modify that noun, but within that sentence you can also embed another noun, itself modified by another sentence. And, so on. Until your head turns to mush… Now, that’s really creative! This limitless productivity, as Chomsky calls it, of such seemingly simple grammatical constructions, is a fundamental part of human language. It’s also, as I hope I’ve shown, a fantastic (and literally inexhaustible) platform for linguistic creativity. I have no idea what Bloom.fm is like as a music app, but there’s no denying the cleverness of its marketing slogan. When it comes to the boundless creativity of the English language, there’s no better advert. If anyone knows any research about this type of construction, where it comes from into English, how long it has been around, and whether it has any equivalents in other languages, I’d be really interested to hear about it! Chomsky, N. (1957) Syntactic Structures. Berlin: Mouton de Gruyter. This entry was posted in Uncategorized and tagged advertising, creativity, english, language, linguistics. Bookmark the permalink.